The boys are back at it again in Blu-ray with the release of South Park: The Complete Fifteenth Season. The boys are back at it again in Blu-ray with the release of South Park: The Complete Fifteenth Season and it's UNRATED. Of course, if you are a fan, you probably already new that. The hilarious fourteen episodes are devoid of ads and any other interference so you don't have a lag in the madness we aficionados have enjoyed for the last 15 years. Sure it's tasteless! Sure it's suggestive! And Yah, it's addictive! Um, did I leave anything out? It's amazing that an adult oriented animated show with so much violence, demeaning, degradation, sexual inferences, adult language, references to our private body parts, etc. could last as long as it has on the air. But, I have the answer to why it still has one of the top adult ratings on television. If ‘they' say all those nasty things, we don't have to. The two-disc blu-ray has all the weekly shows for the past year totally unadulterated from censorship. No skips, bleeps, no ‘use of kind words' when the writers really mean the nasty ones. Complete unrated freedom to get grossed out, made fun of, ridiculed, weirded out, politically incorrect, wrongly informed, mocked, etc; you know all those fun things you love to watch. Lets get right into the listing of the fifteenth season episodes just in case you have not seen the show or have missed a few. 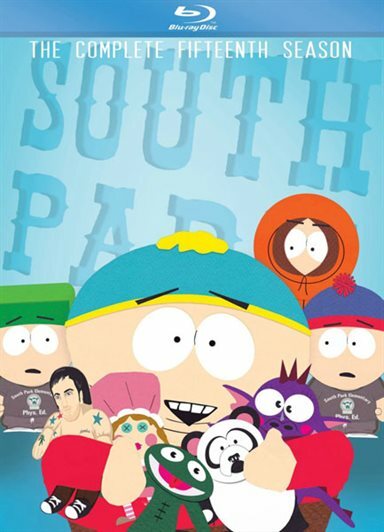 Download South Park: The Complete Fifteenth Season from the iTunes Store in Digial HD. For more information about South Park visit the FlickDirect Movie Database.